Sentinel is now installed! Check it out - just north of Jasper on Capital Blvd. (108 St) . 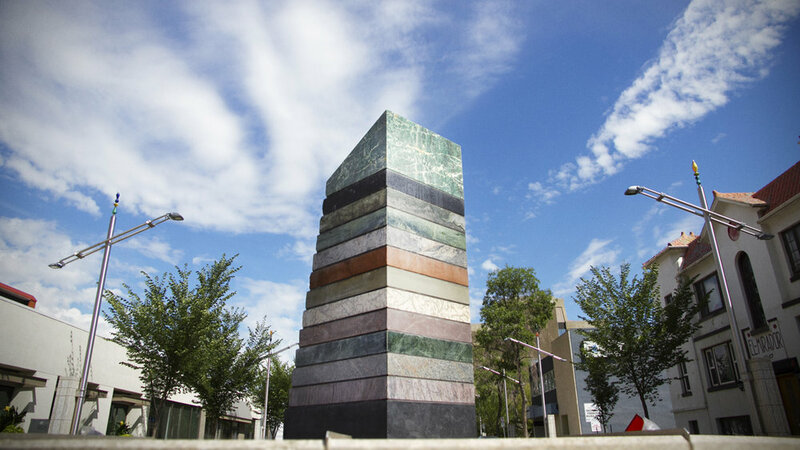 It's a Canada 150 Public Artwork that includes stone from every province and territory. It turned out to be an amazing experience travelling Canada, meeting people and selecting extraordinary rock. Logistics were a little extreme (think 13 different rocks from across Canada to select, ship, cut and install). Kudos to the "The Places" staff for the support they provided during the project. And congratulations to the four other artists commissioned to create work along 108 St.
January 2017- Installed Bequest in St Albert Place. A 50 year Time Capsule project using materials found locally: sandstone from a local farm, Elm wood that is common to the area and Stainless Steel. Created the design to be beautiful and minimalistic to stay "timeless" over its 50 year life.